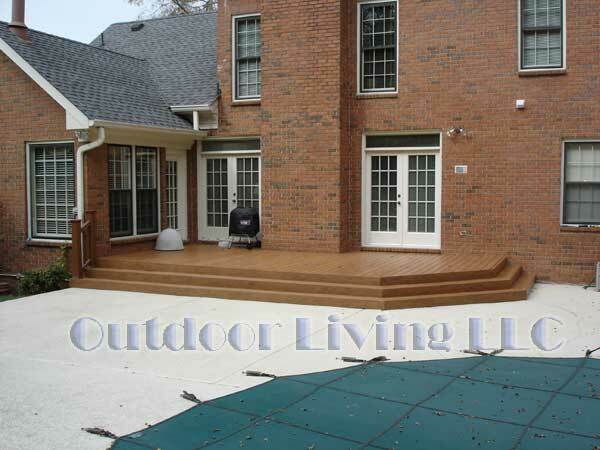 We have constructed several different styles of outdoor decks as well. Just look at some of the things we have done! 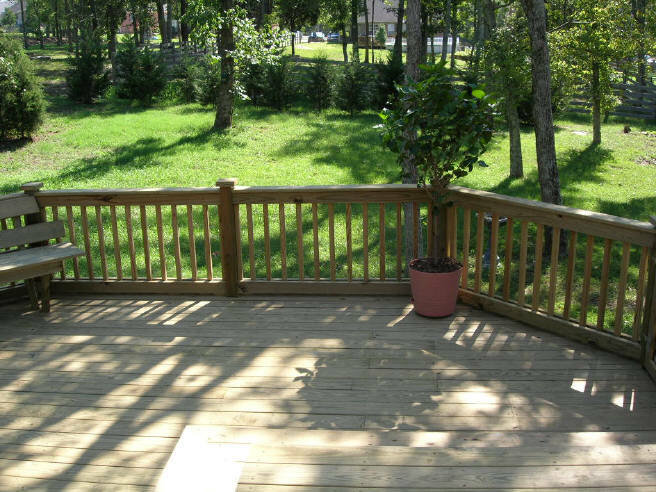 Here is a deck finished out in composite decking and railing. Up close, you'll see the wood grain finish and that we used a hidden fastener system. 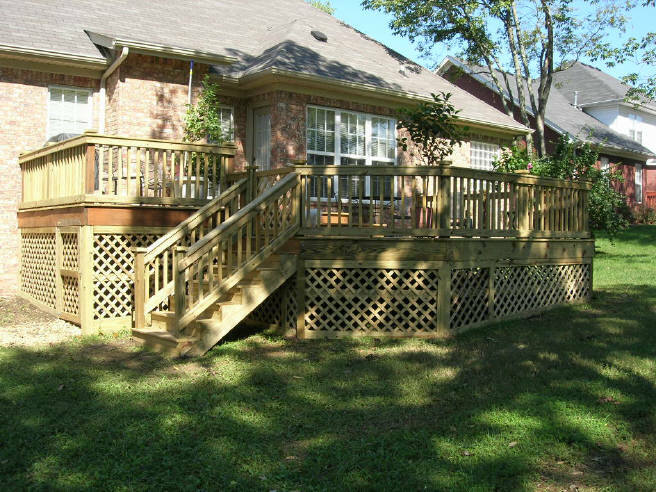 Here we added on to the existing deck to include an arbor over it, and then we build a larger deck one step down with lattice underpinning. Looking from the fire pit towards the house, in the shadows along the top right of the photo, sits the hot tub recessed in the floor. This is your first view as you enter the newly created atmosphere. You have your steps to your left to enter the house, the fire pit straight ahead, and the bar off to your left. Taken from the air, this photo includes the bar, grill, fire pit, and privacy fence. 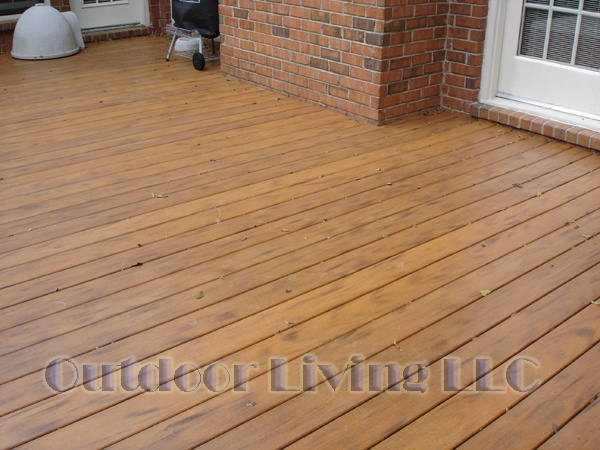 If you have an existing deck, we can add to it and save you some money. 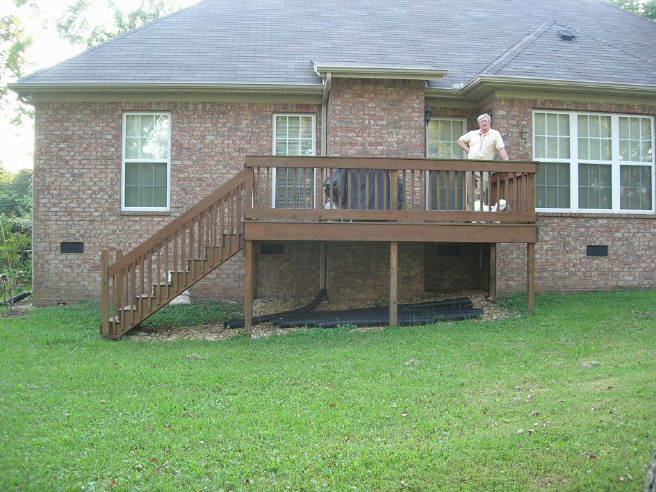 Pictured below, is my friend and homeowner, Sam, and this is the deck he had on his house. 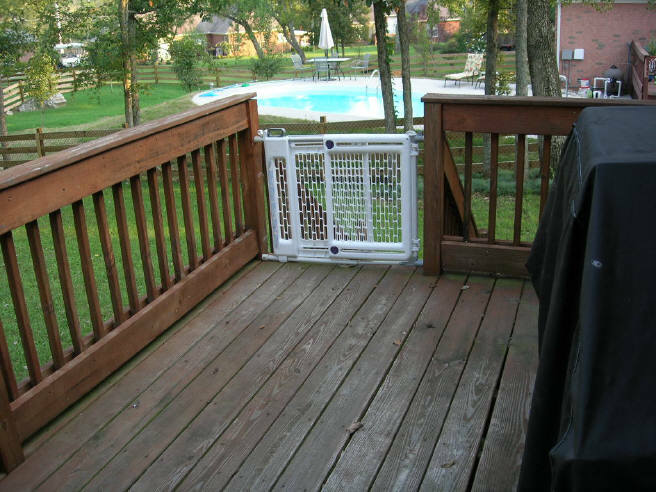 He called us up and asked about adding to it and after careful inspection, it was obvious that the frame of the deck was indeed still in great shape. We removed the handrails, steps, and deck boards that covered the floor and proceeded with new material from there. And here is what happened to Old Faithful in less than one week. A complete makeover. With all new deck boards and new handrails, the whole deck looks like it was just built. It is absolutely beautiful! Take a look at how the posts come up through the handrail and are finished out with a decorative cap. Sam came up with the idea and we found a way to do it. If you have a custom design, let us know, we'll be happy to build to your design and make your house the way you want it to be. 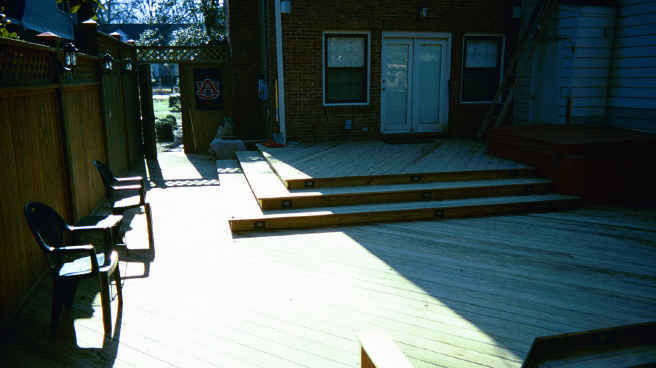 Pictured below is original deck after we finished. I said earlier that it look brand new, take a look for yourself. 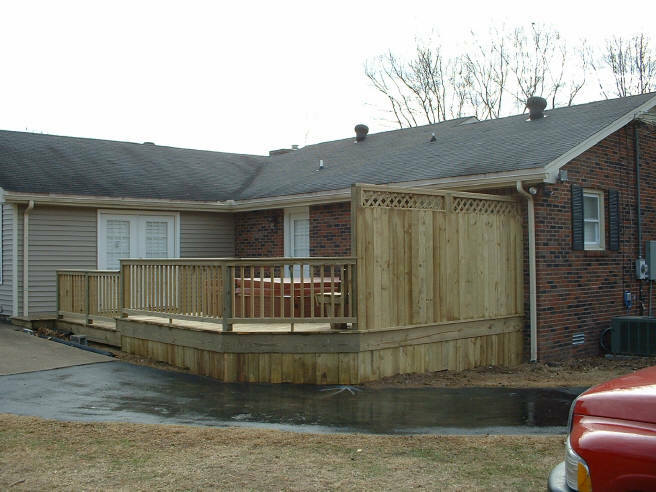 We can do the same thing to your existing deck, as long as the frame is still good. Which, if it's less than 10 years old, chances are the frame is still well within tolerances. Sometimes, they may need some reinforcement, but that is a low-cost item as it is easy to do. Now, we are standing on Old Faithful looking down onto the new addition that was added. 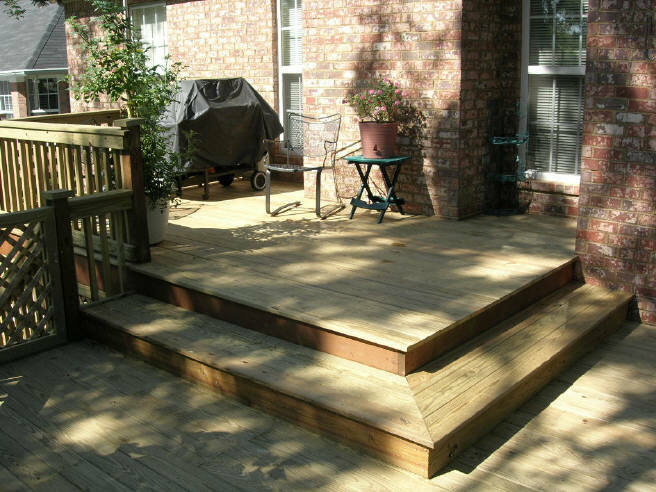 As said before this addition is 14 inches lower, so in this picture, you can see the step down and then the bench seat that sits in the outside corner of the deck. Notice that the corner is not a 90° turn, instead it is offset 45°. That really makes a nice touch these days, with the common arrangement being square. Going in reverse back to the original deck, here is a picture of the gate that was being used. And here is the new and improved picture. Pictured below is the new handrail. 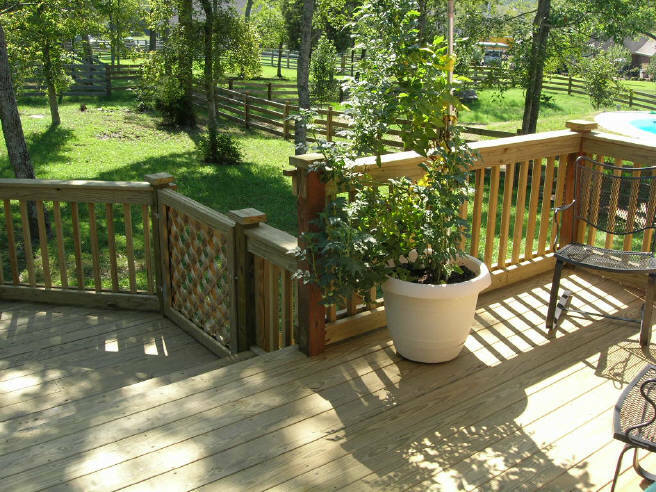 Our handrails are built to be strong and not sag or flex. And we guarantee it! 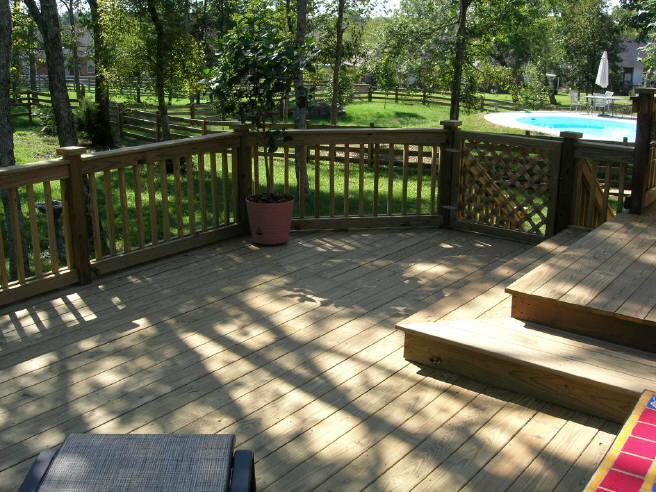 Pictured below is a deck, that is decked out. 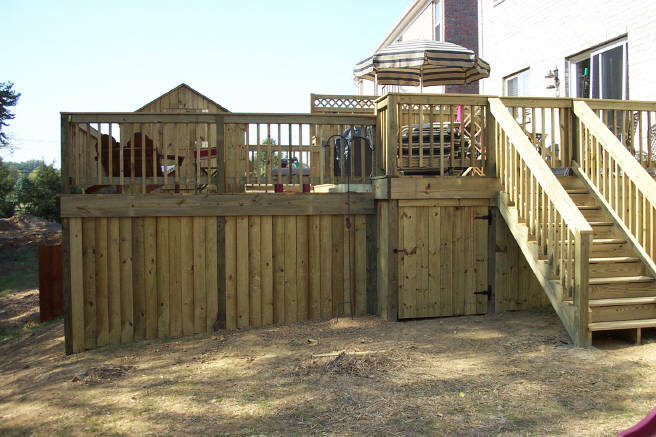 It features a gate on the deck, another gate to get under the deck, a privacy fence on the far side of the deck, and a child's playhouse. 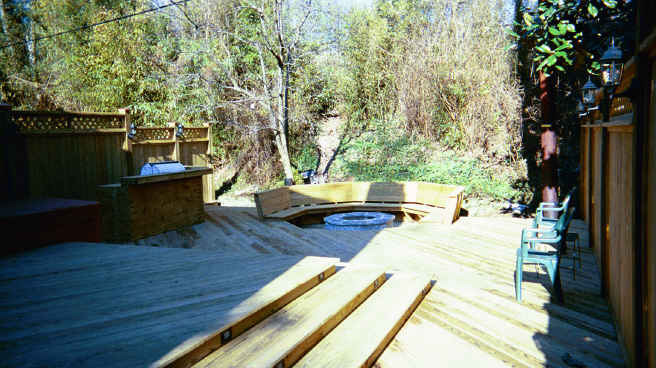 Both decks and all were constructed by Outdoor Living. 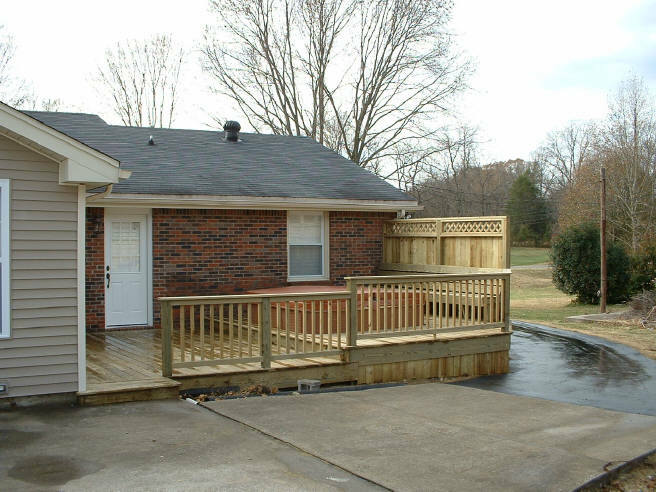 We built this deck in College Grove, TN for Ed. 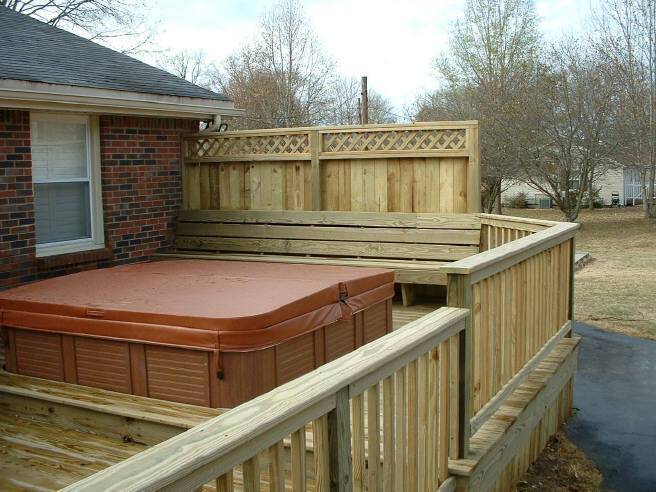 He wanted his tub to be sunk into the floor, a privacy fence, bench seating, and underpinning attached to the bottom of the deck. Not seen in this picture is the concrete pad we poured for the hot tub. We took measurements from the house and driveway to find the exact spot that the concrete pad needed to be, and then poured it. 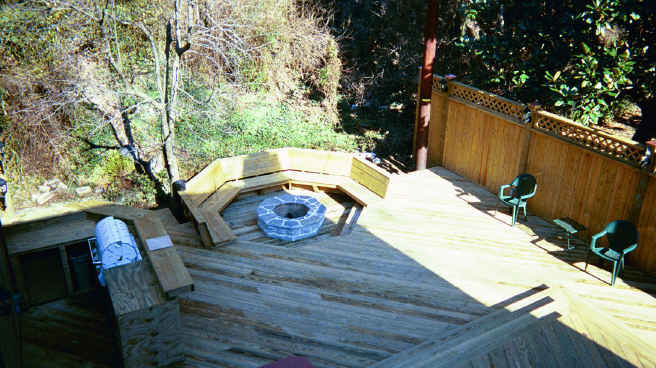 A few days later, after the concrete was cured, the hot tub was placed on the pad and construction on the deck began. 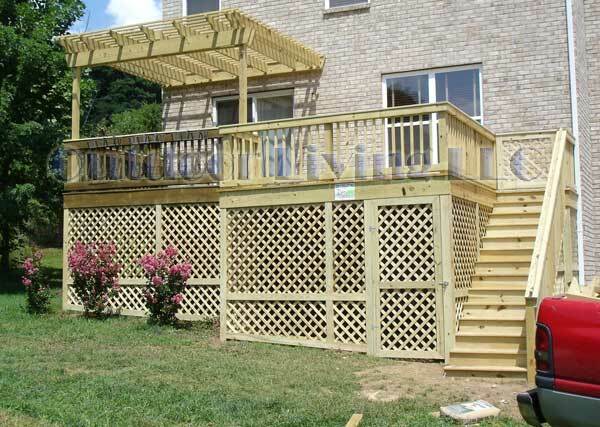 Here we have an upper deck 16' by 20' and a lower deck 28' by 20'. 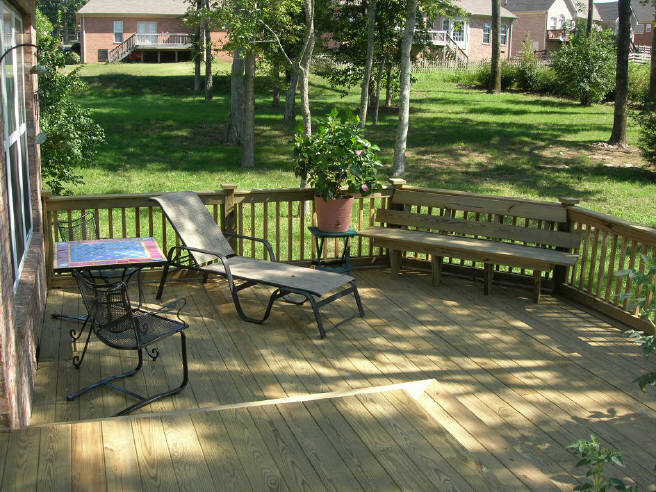 Here, we removed the old existing deck, and built one large deck, with a privacy fence, and arbor. We closed in underneath the deck with lattice. Click here for the full size picture. Serving the Nashville area. All rights reserved.